RIYADH, DUBAI, CAPE CANAVERAL, Florida, USA — Arabsat 6A Satellite, the last of its 6th generation satellites, has successfully been launched this morning by Falcon Heavy, from Cape Canaveral in Florida, USA. 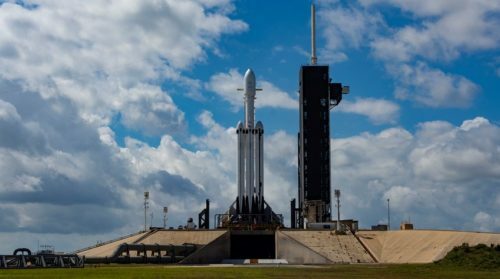 The Falcon-Heavy rocket was launched at 22:35 (GMT), carrying Arabsat 6A satellite, manufactured by Lockheed Martin, to be placed in the exclusive orbit of Arabsat 30.5 degrees East. “Arabsat-6A is a high-capacity telecommunications satellite that will deliver television, radio, Internet, and mobile communications to customers in the Middle East, Africa, and Europe. Built by Lockheed Martin, Arabsat 6A is the largest and most powerful commercial satellite Lockheed martin has ever produced. The modernized LM 2100 includes several innovations that make the satellite more powerful, more flexible and more versatile in orbit. Arabsat 6A provides advanced Ka-spot beam communications services and Ku and Ka-band coverages in addition to other frequency bands. It will be located at Arabsat exclusive orbital position 30.5, supporting Arabsat competitiveness, as the first satellite operator in the region, in respect to its capabilities and satellite broadcasting services,” added Balkheyour.